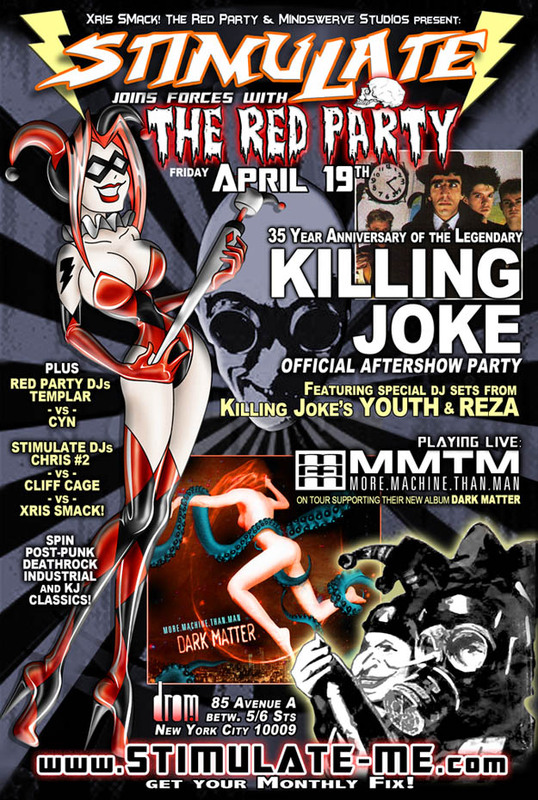 04/19/13 – STIMULATE: OFFICIAL KILLING JOKE Aftershow party w/Special DJ sets by YOUTH and REZA of Killing Joke, plus MORE MACHINE THAN MAN live! STIMULATE: OFFICIAL KILLING JOKE Aftershow party w/Special DJ sets by YOUTH and REZA of Killing Joke, plus MORE MACHINE THAN MAN live! plus MORE MACHINE THAN MAN live! supporting their new album "Dark Matter"
plus DJ's Templar and Xris SMack! 34 CDs in the super-deluxe version of The SIngles Collection, including the tracks on the rarities disc. 1) ‘Transient Place’ - From ‘Freispiel: The Soundtrack’. 2) ‘Zennon’ - B-side of ‘Loose Cannon’ single. 3) ‘Drug’ - From the ‘Mortal Kombat’ soundtrack. 5) ‘Our Last Goodbye’ - From the ‘Free The Memphis 3’ album. 9) ‘Pandemonium’ (Aotearoa Mix) Full-length. 12) ‘iBuy’ – with Tim Burgess. Track for Classic Rock collaborations CD. (A conversation on philosophy between Youth & Jaz circa 2003). Track from ‘Democracy’ (previously unreleased version featuring this celebrated violin player).